Babesiosis is a tick-borne malaria-like illness caused by the intraerythrocytic protozoan Babesia. In the U.S., it is typically contracted in the Northeast or upper Midwest – in southern New England or New York State and Wisconsin or Minnesota. Out of more than 100 species of Babesia, only a few have been identified as causing human infections. Babesia microti is the primary agent of human babesiosis in the U.S., while nearly all cases in Europe have been attributed to Babesia divergens. The Babesia venatorum species is endemic in northeastern China. Little is known about the occurrence of Babesia species in malarial areas where babesiosis can easily be misdiagnosed as Plasmodium (the agent of malaria). People who are infected often do not show any symptoms. However, some people develop nonspecific symptoms such as fever, chills, sweats, headache, myalgia (muscle aches), arthralgia (joint pain), loss of appetite, nausea or fatigue. These symptoms typically occur after an incubation period of one to four weeks and may last for weeks. Babesiosis is sometimes fatal, particularly in senior adults, patients with asplenia (affected spleen function), and patients with AIDS. In such individuals, babesiosis may resemble Plasmodium falciparum malaria, with high fever, hemolytic anemia, hemoglobinuria, jaundice, and renal failure. Blood clots, organ failure, and unstable blood pressure may be observed in severe cases. Death may also occur, although rarely. Babesia protozoa invade and cause lysis of red blood cells in mammalian hosts. Babesiosis also causes hepatosplenomegaly (enlargement of the liver and spleen) and hemolytic anemia (anemia due to the break-up of red blood cells). The disease is more severe in patients who are immunosuppressed, splenectomized (lack their spleen), or elderly, and can cause death. Turmeric, botanically known as Curcuma longa, has powerful anti-inflammatory effects, and carminative properties, which can reduce gas and nausea, as well as anti-bacterial and anti-viral effects. Moreover, turmeric has antioxidant and hepatoprotective or liver-protecting qualities, which may help reduce liver damage from antibiotics used to treat babesiosis. Treatment involves antibiotics, usually clindamycin and quinine or a combination of atovaquone and azithromycin. Many people do not become sick enough with babesiosis to require treatment; most of the otherwise healthy patients infected appear to have a mild illness and recover without specific drug treatment. Meanwhile, treatment is recommended for all diagnosed cases to prevent sequelae and potential transmission through blood donation. A combination therapy with clindamycin and quinine or atovaquone and azithromycin is more effective for senior adults, immunocompromised, or asplenic patients than either atovaquone or azithromycin alone. Do not give quinine to pregnant patients. 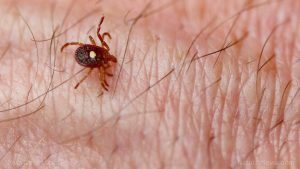 Babesiosis is a tick-borne disease caused by the parasite Babesia. which is endemic in the U.S., typically in the Northeast or upper Midwest – in southern New England or New York State and in Wisconsin or Minnesota. Babesiosis may resemble Plasmodium falciparum malaria, with infected individuals exhibiting similar symptoms such as high fever, hemolytic anemia, hemoglobinuria, jaundice, and renal failure.